Wall Street has turned its attention to a new stock market crash warning sign – an impending $1 trillion meltdown in the bond market. According to estimates from Goldman Sachs Group Inc. (NYSE: GS), bondholders could lose a staggering $1 trillion if Treasury yields suddenly rise by 1%. That could even surpass the hefty losses realized on mortgage bonds without government backing during the 2008 financial crisis. "Some investor entities would likely experience significant distress," Goldman analysts wrote last week. "Rising yields should be on the short list of scenarios to be monitored by risk managers." In the decade-long hunt for yield and safety, money managers and investors have piled into longer-dated securities. And when interest rates rise, which is the U.S. Federal Reserve's aim, bond prices will slip and long-term debt prices will slide. With a large number of investors now holding long-term debt positions, the potential losses from rising rates have grown dramatically. And even the income investors receive from bonds will do little to shield them from the pain of having principal locked up at lower rates, Goldman Sachs warns. Goldman still believes there is a 40% chance the Fed will raise rates in July. That is almost double what the bond market projects. But Goldman believes Fed Chair Janet Yellen made it clear this week that the U.S. central bank is intent on raising rates this year. Speaking Monday at the World Affairs Council in Philadelphia, Yellen gave a largely upbeat assessment of the U.S. economic outlook and said interest rate hikes are coming. Still, Yellen gave little hints as to when the hike will take place. Yet her comment was enough to send the bond market dropping. Ten-year Treasuries suffered their biggest decline in three weeks following Yellen's speech. Goldman isn't the only one concerned about the fragile state of the bond market. Legendary bond investor Bill Gross is also very worried about an implosion in the space. But his concerns stem from the growing use of negative interest rates. The $10 trillion of negative-yielding global government bonds is a "supernova that will explode one day," Gross said in a tweet Thursday. The founder of bond giant PIMCO and now a fund manager at Janus, Gross said global yields are at their lowest levels in 500 years of recorded history. A number of other fund investors have voiced their fears over negative rates and a looming "black swan" event. The black swan theory is a metaphor describing an event that comes as a surprise, has a major effect, and is often inappropriately rationalized after the fact with the benefit of hindsight. Capital Group, which manages $1.4 trillion, has cautioned that negative interest rates are distorting financial markets and economies and could lead to "potentially dangerous consequences." DoubleLine's Jeffrey Gundlach recently said negative interest rates "are the stupidest idea I have ever experienced." He warned "the next major event [for markets] will be the moment when central banks in Japan and in Europe give up and cancel the experiment." Larry Fink of BlackRock warned in his latest investor note that while low borrowing costs give an advantage to many companies and countries, they are a distinct disadvantage to savers. "There has been plenty of discussion about how the extended period of low interest rates has contributed to inflation in asset prices," Fink wrote. "Not nearly enough attention has been paid to the toll these low rates – and now negative rates – are taking on the ability of investors to save and plan for the future." 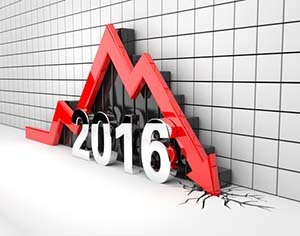 And if these warning signs lead to a stock market crash in 2016, you don't have to be caught off guard. Here are three ways investors can plan for and protect against a stock market crash. Short the S&P 500: Take advantage of a pullback in stocks by shorting (betting against) the broader market. You can do this with the ProShares Short S&P 500 ETF (NYSE Arca: SH). This $3.03 billion market cap exchange-traded fund rises when the S&P 500 declines. Hold cash: In a world awash in negative rates and diminishing currency valuations, the U.S. dollar stands out. Holding cash when stocks retreat means you have the means to buy beaten-down stocks at attractive prices.